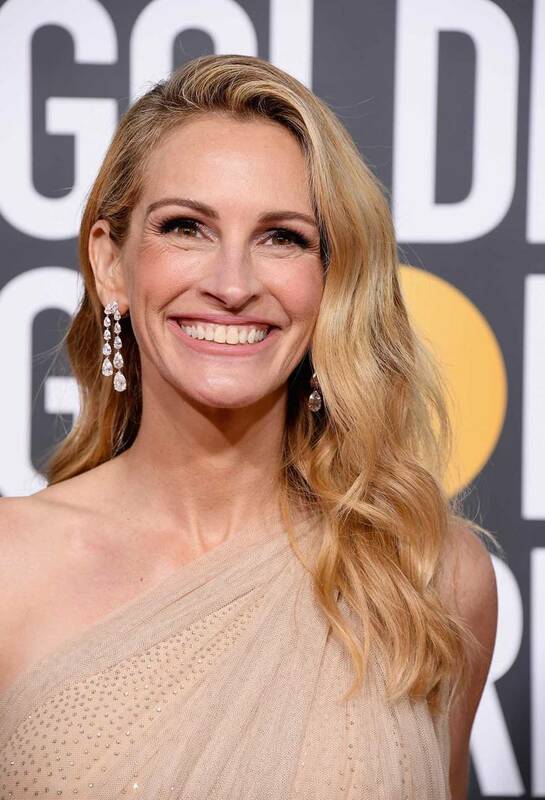 The Golden Globes 2019 red carpet marks the start of the annual awards season and our favorite celebrities hit the red carpet in an array of incredible pieces. Star of If Beale Street Could Talk Kiki Layne is giving us princess vibes in this semi-sheer, full skirted blush tulle gown by Dior, paired with Bulgari diamonds. We are in love! Saoirse Ronan channels 1920s style in this custom Gucci antique platinum beaded sheer tulle gown with crystals and a plunging deep V cut. Pretty Woman star Julia Roberts looked amazing in a flowing one-shoulder top over black peg-leg trousers piece by Stella McCartney. Gemma Chan looked beautiful in a navy gown from the Valentino Fall 2018 Haute Couture Collection. Black Panther star Lupita Nyong’o sparkled in a strapless custom CALVIN KLEIN BY APPOINTMENT fitted cobalt blue chain fringed dress paired with silver drop beads. Rachel Weisz wearing Celine by Hedi Slimane and Cartier jewellery. Regina King opted for a super gorgeous Alberta Ferretti and Messika jewellery.